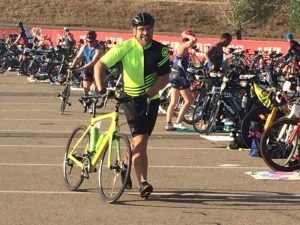 Several months ago, after completing an olympic length triathlon, I signed up for a Half Ironman length triathlon (1.2mi swim, 56 mi bike, 13.1 mi run or 70.3 miles) that took place about a week ago. 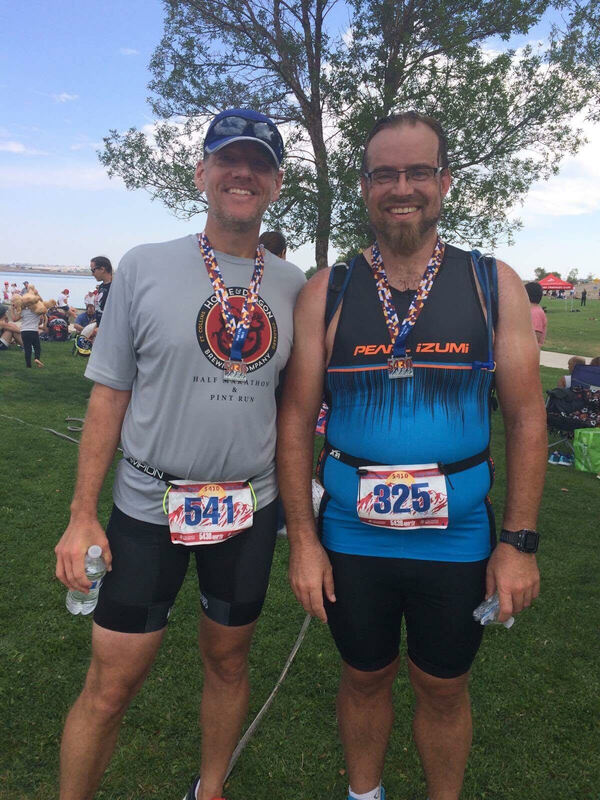 With a summer to train, it seemed like I might be able to get ready and my friend Jason who I convinced to start doing triathlon with me already signed up; how could I let him suffer alone? After working hard through the summer with only one week away the doubts start setting in: did I train enough? Will my bike work? Why in the world did I pay money to do this? Am I going to die? But then it was go-time and Jason and I arrived at the Boulder Reservoir before dawn; well before dawn, like pitch black before dawn, with the sliver of the Harvest Moon hanging low in the sky which not coincidentally was the name of this triathlon: Harvest Moon. Not only was it black, but it was about 45 degrees cold. No lights except the headlights from cars left running and some head lamps from those more prepared than we were. 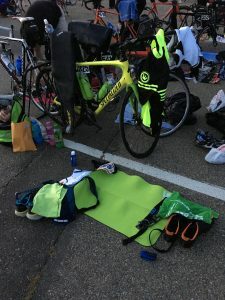 We filled up the tires on our bike one last time and walked them to the transition area, carrying a ridiculous amount of equipment, as we prepared to suffer for several hours. The anxieties from the week before faded, here we were and we would have to roll with whatever challenges lay ahead. 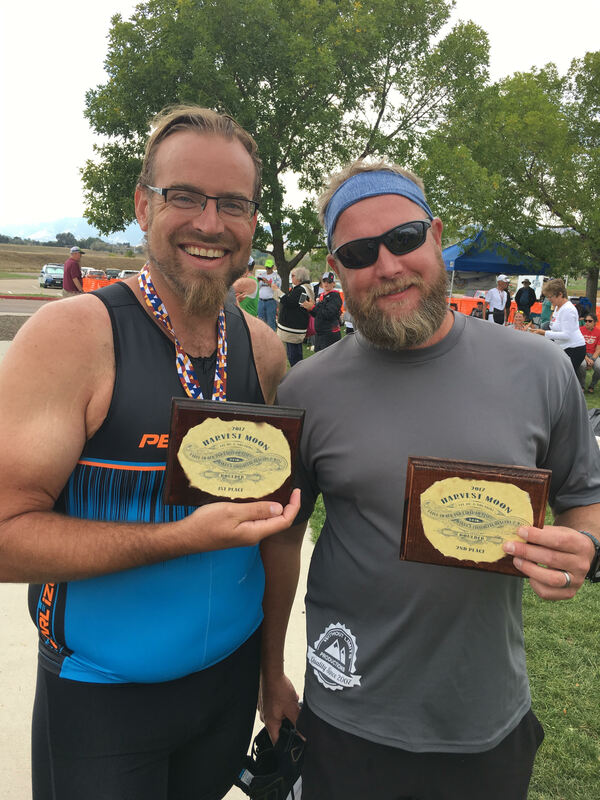 Win the Clydesdale division (against my other larger competitors topping 220 lbs) — After the last Olympic length triathlon, another Clydesdale named Kevin beat me by under a minute to take first place. We both knew we were going to be racing this distance and became Strava friends and even set up our transition areas near one another. But there were 9 other people registered as Clydesdales before the race started. Ominously, only two finished the previous year! But at this point, finishing was the main thing on my mind as I unpacked my transition area, setting out clothes for each event, trying to stay warm and mentally simulate each step. After a quick warm up jog and a trip to the port-a-potty, it was time to don the wetsuit which absolutely makes me look like a whale. Then all the rubber clad athletes gathered on the beach, ready to jump in the water and swim. The horn blew and the splashing began. Kevin and I stayed neck and neck almost the entire time, but he pulled ahead at the end (he is a much stronger swimmer and runner). Glad to get out of the water and see my parents cheering, it was time to start pedaling. But first I had to remove the wetsuit which after a swim is a lot like spinning around in circles (swimming makes me a little light-headed) and then taking off a pair of tight jeans as quickly as you can. It’s embarrassingly awkward. Fortunately, everyone else is so busy figuring it out themselves that no one is watching. 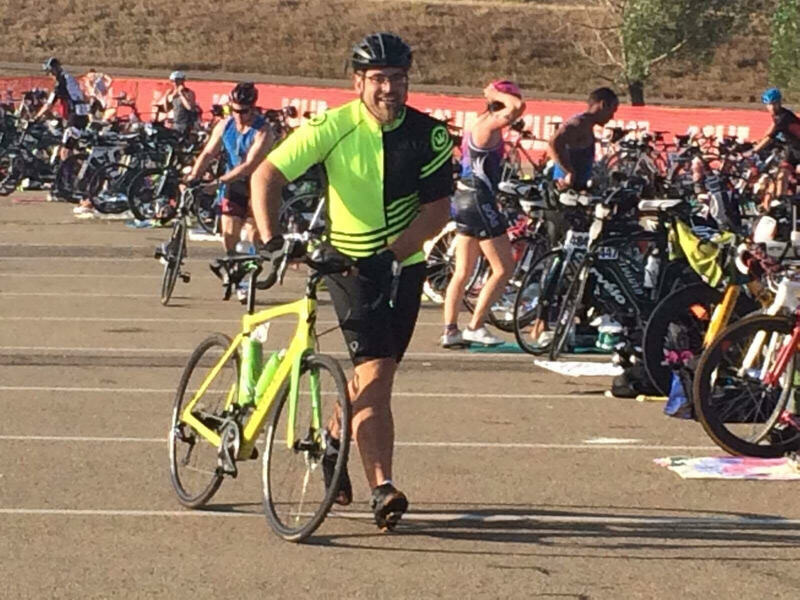 After throwing on my bike jersey, helmet, gloves and shoes, I made my way over to the beginning of the bike leg. Kevin had already left the transition area as I struggled to get it all together and set off. The bike course was two laps and it’s mostly up hill at the beginning of each lap. My bike training paid off and after a few miles, I caught Kevin and mentioned that I didn’t think Clydesdales were supposed to do hills, and carried on. Over the next several hours, I ate 900 calories of almost pure sugar and drank almost a gallon of water. Every once in a while taking a few moments to enjoy the beautiful mountain foothills and scenery. Near the end the second lap, excited I had no mechanical issues or flat tires, I was ready to stop biking. I hopped off my bike to numb feet that turned to pain as they awoke only for me to punish them some more. Another change of clothes, number strapped on, I headed out for one of the longest runs of my life. Again the run course had a few hills at the beginning before gradually descending. After about 5 miles my right foot felt like it was developing a blister, but when you’re racing you don’t want to stop. Fortunately, I remembered a story of my friend who didn’t stop as he was feeling the blisters while running a marathon and ended with ravished feet: people asked him why he didn’t stop to fix it and he didn’t have a good answer. I also realized it was going to take 5 seconds to adjust my shoe, so I forced myself to stop and tighten the shoe: a half mile later, the pain had subsided. I kept waiting for the “wall” of exhaustion to overwhelm me, and while there were various points where my legs felt like they had turned to lead, I kept plodding along at my sub-10 minute mile pace which was my goal even speeding up a little toward the end and crossed the finish line. This production company puts a slip-n-slide at the end of the race which I tried during the Olympic length event, making it a third of the way and developing a bad hamstring cramp. I skipped it after this race. Having accomplished the first goal by finishing, I looked at my final time: 5 hours, 29 minutes! I had beaten my second goal too by a pretty good margin. Even though all three courses were a little short of the proper length, my pace in each had me on track to finish in 5 hours and 50 minutes. Jason who started 10 minutes behind me, finished 2 minutes after me, thus once again beating me, this time by only 8 minutes – both of us exceeded our expectations for the race. And as for the final goal, I never saw Kevin again but that didn’t mean another Clydesdale beat me and my dad mentioned that the 1st place Athena (women over 165lbs) finished a while ago (she beat me by 20 minutes and once I saw who she was, I remembered her passing me and a few other guys around mile 7 and said as she passed us, “Alright boys let’s crush this” and then passed all of us). But I was the first of the horses to cross the finish line. (Results). Kevin crossed about 20 minutes later, which was impressive since he had been unable to train much due to injury and travel. Reflecting over this journey, finishing my first “Techman Tri” (Ironman triathlon worth of activity in a month) almost 2 years ago, the goal never started as doing long distance triathlon or even real triathlons, but to simply exercise consistently. Elliptical and rowing gave birth to running and swimming. The races became a chance to test myself and as I saw improvements, gave birth to curiosity about just what might be possible. This particular race never felt crushing and demoralizing, but rather felt very challenging and therefore engaging. Rather than being the conclusion of a journey, it feels like a milestone on a path that I’m continuing to venture out on: one step at a time. Next stop, Kona. Full tri in under 9 hours? So enjoyed reading. Thanks for sharing! SO proud of you bro! !